Liquid Comics houses a wide selection of comic book libraries which entice fans with Indian characters fashioned by Indian creators. They can now take complete advantage of these offerings as the company brings its Indian comic book titles to the Sony PSP platform in digital formats. 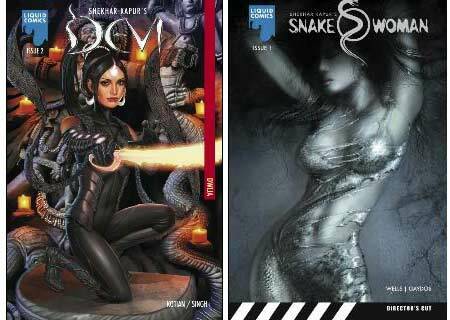 Liquid Comics rolls out various titles such as Ramayan 3392 AD, Devi, The Sadhu, Snake Woman and Beyond. Acclaimed filmmaker Shekhar Kapur is renowned for his work in Elizabeth and Golden Age. He brings to the PSP his imaginative creations Devi and Snake Woman. In the former title, Tara Mehta is a young woman living in the futuristic Asian city of Sitapur. She is pulled in the middle of a divine battle that takes place between the demon Lord Bala and Gods of Light. Snake Woman is a story about Jessica Peterson who has the ability to transform into a vicious Snakewoman. In the title, she must avenge the desecration of a Naga temple that was brought about by foreigners. Jessica must now confront the monstrosity within her while also steering clear of a mysterious organization called as ‘The 68’. The futuristic re-imagining of the Indian epic, Ramayan 3392 AD is seen taking place in a post-apocalyptic world where the people of that time are plagued by evil. It is now up to the prince brothers Rama and Lakshman to stand up against the Nark which are led by evil Ravan himself. They are the humans only hope against the struggle with the forces of darkness slowly closing in. The Sadhu title features the tale of a British soldier named James Jenson. He seeks refuge with the Sadhus after the murder of his family. There he is trained in the supernatural arts but is now faced with a grave decision; whether to use his teachings for inner peace as intended by the Indian mystics or to strike revenge on those responsible for his loss. Beyond is created by well-known author Deepak Chopra and tells a story of Michael Morton and his family which consists of wife Anna and son, Ty. When on a vacation to India, Anna goes missing while traversing through the busy streets of the country. Desperate to find her, Michael Morton and Ty go on a dangerous journey that involves physical as well as metaphysical danger, all in the endeavor to reunite with Anna. PSP owners can look forward to new comic books every week via PlayStation. Liquid Comics attach a $1.99 price tag to each issue.